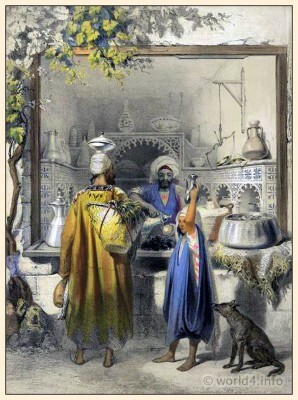 A Zeyat or Oil Seller with Customers in his Shop in Cairo. A Zeyat or Oil Seller with Customers in his Shop in Cairo. Characters, costumes, and modes of life, in the valley of the Nile. Painting by Emile Prisse d’Avennes.